OKLAHOMA CITY (October 17, 2011) - Rep. T.W. 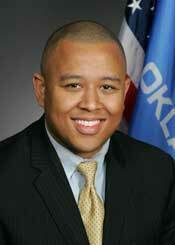 Shannon has been elected House Speaker-designate for the 54th Oklahoma Legislature. The House Republican Caucus elected Shannon (R-Lawton) as Speaker-designate during a caucus meeting Monday morning at the Capitol. Should Republicans maintain their majority in the House following next year’s election cycle, Shannon will be next in line to serve as Speaker of the House beginning in November 2012, when current House Speaker Kris Steele leaves office due to term limits. Shannon and Reps. Jeff Hickman, R-Fairview, and Mike Reynolds, R-Oklahoma City, were the candidates for Speaker-designate. “The three candidates who made themselves available to fill this position are fine public servants and are to be commended for their enthusiastic desire to be leaders in Oklahoma’s effort to grow as a state,” Steele said. Shannon, 33, said he looks forward to working with Steele and the rest of the House in the coming months. Shannon, an enrolled member of the Chickasaw Nation, is a sixth generation Oklahoman and third generation Lawtonian. He has served in the Legislature since 2006, representing House District 62. Shannon previously served as a congressional staffer for U.S. Reps. J.C. Watts and Tom Cole. Shannon and his wife, Devon, also a Lawton native, are the parents of a daughter, Audrey Grace, and a son, Tahrohon Wayne II. Also of note: once formally elected Speaker in November of next year, Shannon will become the first black speaker of the house in state history. Just how big is Oklahoma's government?